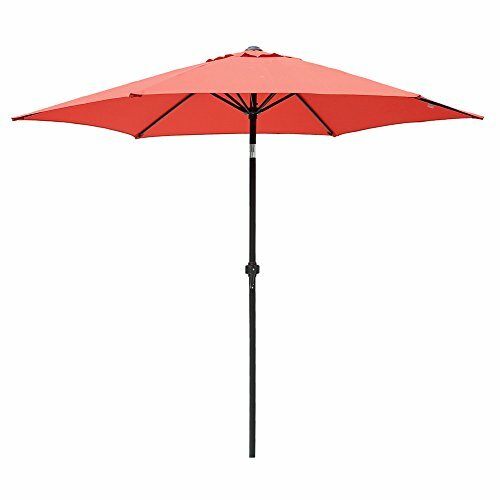 Le Papillon Market Patio Umbrella provides the finest protection under the sun, and brings the perfect shaded spot to entertain your friends, family and customers. Our market umbrellas are styled with the classic, crisp and elegant look that accents any outdoor setting. Featured with fade- and mildew-resistant canopy, our easy-tilt umbrella follows the sun all day, blocking out 98% of UV rays. The sturdy frame, finished in smart, weather-resistant powdercoat, opens and closes effortlessly with a smooth-turning crank on the pole. Suitable for small or large patio umbrella stands with a table, or with the large stand on its own ,(sold separately), our outdoor umbrellas are ideal for both of your commercial and residential application. -Canopy Fabric: 100% solution dyed polyester, fade- and mildew-resistant, USA standard Grade 5 min. at 1000 hours. -Assembly and Maintainance: minor assembly required; spot clean with mild soap and water; areas subject to turning and sliding can be treated with a non-staining lubricant spray (silicone-based); when not in use, or in inclement weather, close and cover umbrella with protective cover (not included). 8 feet shade can share your 41" to 44" round, square or rectangle table with 3-4 chairs. Crank handle can raise up and putting down, tilt system with push bottom, 45 degree locking tilt positions.